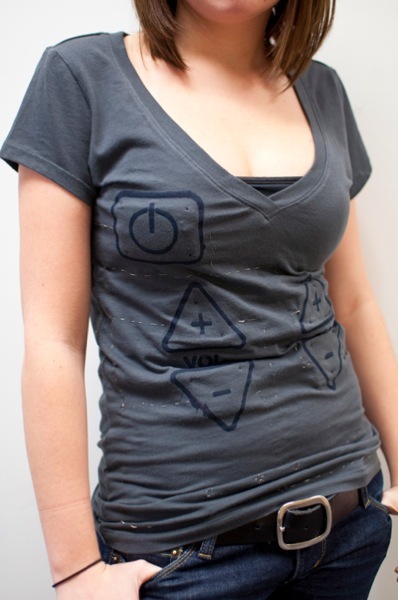 Remote control t-shirt « Adafruit Industries – Makers, hackers, artists, designers and engineers! This remote control t-shirt is an exploration of wearable technology. Utilizing the body as a platform for control and functionality, this t-shirt can control any television that can connect with a universal remote. Understanding how technology works gave way to this concept. At first glance, the shirt looks like any normal graphic t, until you notice the conductive thread sew throughout the shirt. The conductive thread connects to soft switches to create a circuit board. Who wouldn’t want to be able to sit on the couch and wear a remote?! Now you’ll never have to look for a small remote in the couch cushions again! Click here to see a demonstration! .